Ladder-leaders Officer are in total control against the bottom-placed Aura Vale. After winning the toss and electing to bat, the Lakers struggled against the Bullants bowling attack, led by Shannon Marum (4/11) and Sean Hinkley (3/30). Marum produced a stunning four-over spell, which helped dismiss the Lakers for just 98 runs. In reply, Officer will resume play on day two at 3/86 with Sean Marum (24 not out) – who is backing up his fine bowling display – and Darren Kneebone (19 not out) at the crease. Devon Meadows have set a strong total for Emerald to chase down after electing to bat on day one. The Panthers were in control all day and a brilliant unbeaten ton from Luke Howard (106 not out) was the highlight of the day. A half century from opener Henry Dolphin (52) was also important in helping the Panthers to a total of 6/239. Catani opener Trent Adams (82) powered the Cats to a total of 207 against Tooradin. The Cats also got a half century from Brad McDonald (56), while Seagull Tim Huguenin (4/50) was impressive. Tooradin had to face a tricky four-over period to end day one and unfortunately for the Seagulls, Cat Mitchell Gregson claimed the key early wicket of opener Fraser Rendall (0) to have Tooradin at 1/2 entering day two. Cranbourne Meadows were dismissed for 129 by Carlisle Park, thanks to an even performance from the Vikings bowling attack. Garry Godfrey (3/3), Dean Lyddy (2/21), Gurpreet Mall (2/35) and Christopher Slater (2/36) worked well together, keeping the pressure on the Rebel batsmen. In reply, the Vikings are far from home and will enter day two at 2/38, with Iqbal Soi (22 not out) and Gurpreet Mall (1 not out) at the crease. Thanks to one of the more spectacular bowling displays in recent memory, Jack Sharlassian (7/40) has Upper Beaconsfield in the box seat against Clyde. In 24 brilliant overs, which included nine maidens, Sharlassian was near-unplayable for stretches and had the Cougars on the back foot from the outset. Clyde opener Ben Reilly (46) was a lone hand for much of the Cougars innings and they were dismissed for 154. Pakenham Upper/Toomuc is in a strong position against Cardinia. The Yabbies were led by opener Justin Harris (81) who played a controlled innings, while Adam Tucker (41), Jake Abel (29) and Mark Johnson (27 not out) all made solid contributions. Matthew Scott (4/47) was the pick of the Bulls bowlers as the Yabbies put on a total of 6/241. Cranbourne Meadows will have a low total to chase on day two of their clash against Officer. The Bullants struggled to string partnerships together as a balanced Rebels bowling attack consistently grabbed key wickets. Adrian Woods (27) top-scored for the Bullants, who were dismissed for a total of 126. In reply, the Rebels will begin day two at 0/8 after successfully navigating seven tough overs to end day one. Pakenham will have a total of 197 to defend when play resumes on day two of their clash against NNG/Maryknoll. After struggling early, the Lions middle order stood up and revived the innings as Troy Wilson (51) and Dale McCraw (28) delivered vital runs. Joshua Atkinson (6/59) was a man on a mission for the Marygoons with a fine display of bowling. Kooweerup put on a batting masterclass against Merinda Park. The Demons were simply irresistible as partnerships developed throughout the innings, headlined by a 96-run stand between Daniel Tannahill (70) and Brent Wilson (35) for the second wicket. Terrific contributions from Scott Gray (45) and Thomas Cairns (43 not out) helped Kooweerup post the monster total of 325. Hamish Raymond (3/45) and Chris Smith (3/49) were impressive in an otherwise rough day for the Cobras. Emerald and Pakenham look to be set for a tight end to their game when play resumes on day two. The Bombers, led by Danny Thomas (36), posted a total of 152 as Kodey Davidson (3/28) and Jordan Seers (3/37) claimed key wickets for the Lions. After restricting the Bombers to a small total, the Lions batsmen have struggled early and Pakenham will resume day two at 2/25. The Victorian Vikings will be searching for an outright win over Lang Lang when play resumes on day two. The Tigers had only two batsmen score over 12 runs – Joseph Dalgleish (28) and Matthew Waixel – as Hanish Gupta (5/7) ran riot in his nine overs of bowling to help dismiss Lang Lang for just 91 runs. Kanishka Wickramanayake (3/10) was also impressive for the Vikings. In reply, the Vikings have piled on the runs and stand at 3/115 after 19 overs as Kanishka Wickramanayake (71 not out) punished the Tigers bowlers. Carlisle Park’s batsmen were unable to stay at the crease to support Brendan McCarthy (57 not out) against NNG/Maryknoll, dismissed for 130 as Abhi Sharma (4/15) took over the game. In reply, the Marygoons are also finding batting difficult and will resume play on day two at 3/48 after Harinderjit Brar (2/15) claimed key wickets late on day one. Officer was in an aggressive mood against Nyora after being sent into bat by the Maroons. The Bullants opening pairing of Brent Pullen (77) and Jack James (48) set up the innings perfectly with an impressive 109-run partnership. Aidan Pipicelli (50) and Tim Smith (27 not out) also produced strong innings, allowing the Bullants to declare with a total of 3/233 after 56 overs. The Maroons (3/25) are struggling with the bat and the Bullants will be searching for an outright win on day two. Merinda Park had six batsmen score over 30 runs and posted the big total of 300 against Pakenham Upper/Toomuc. The Cobras had strong partnerships throughout the innings, with Bo Hellmann (58) and Nathan Francis (54) top scoring in a great team effort. Jonathon Rewell (3/47) was the pick of the Yabbies batsmen. Clyde piled on the runs against Devon Meadows after a masterful century from Brett Whittingham (122). It was Whittingham’s third century in seven innings this season and he punished the Panthers bowlers to all parts of the ground with 22 4s. The Cougars went onto post a massive total of 335, while Peter Deighton (4/56) battled hard all day for the Panthers. Cranbourne Meadows will be defending a total of 279 against Tooradin. The Rebels got strong contributions throughout the innings, but Brett Richards (88) was undoubtedly the star of the day as he hit 8 4s and 4 6s in a brutal display. Jack Mannix (3/62) was the pick of the Seagulls bowlers. Cardinia (112) struggled with the bat against Clyde and will have work to do on day two. The Bulls chose to bat first, but Mark Coe (4/11) and Manpreet Sandhu (3/17) made them rue that decision. In reply, the Cougars stand at 2/29 after 20 overs. Catani (9/274) is in the box seat against Devon Meadows. The Cats were led beautifully by opener Chris Duncan (129) who produced a stunning batting display and partnered with Danial McFarlane (68) for a 139-run stand. Blake Roberts (3/26) and Robert Worstelling (3/55) were the pick of the Panthers bowlers. 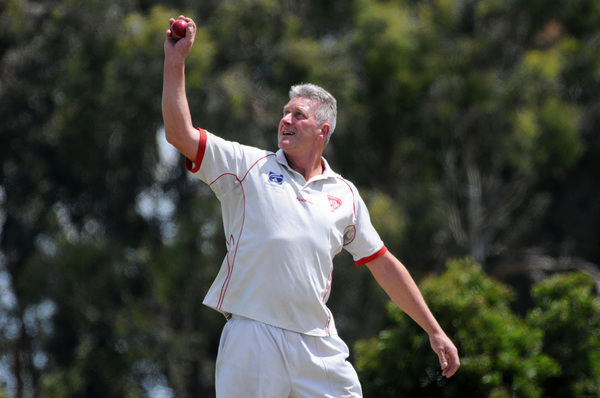 Pakenham will be searching for an outright win over Cranbourne Meadows on day two of their encounter. The Rebels (99) were no match for the Lions bowling attack as Zac Downes (3/28) took key wickets. In reply, the Lions have turned it on – led by Adam Alberni (49) – and will enter day two at 1/112 with Paul Hart (31 not out) and Dennis Porter (25 not out) at the crease.